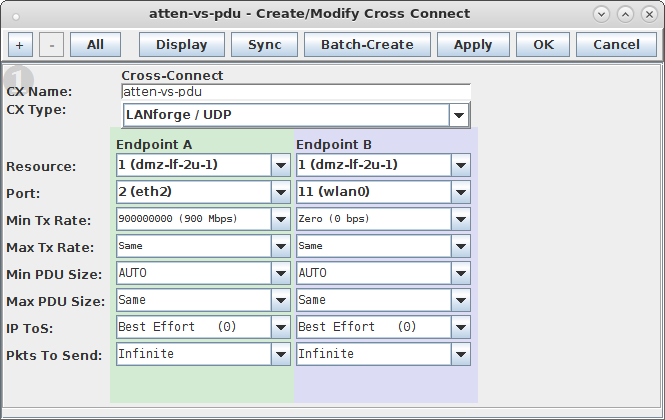 Goal: Compare WiFi performance for 'download' traffic (AP to Client) as Payload Size and RF Attenuation levels change using a WiFi access point, a LANforge Attenuator and a LANforge Virtual Station. 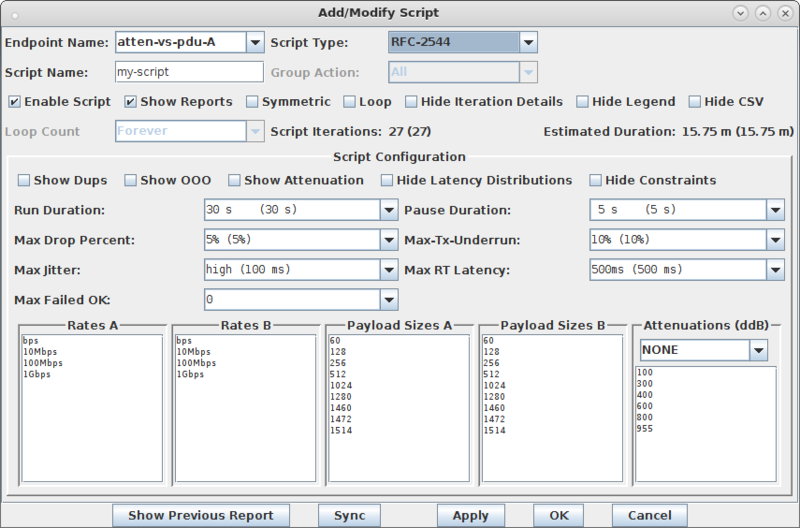 Traffic is generated by a RFC-2544 script on a Layer-3 UDP connection. 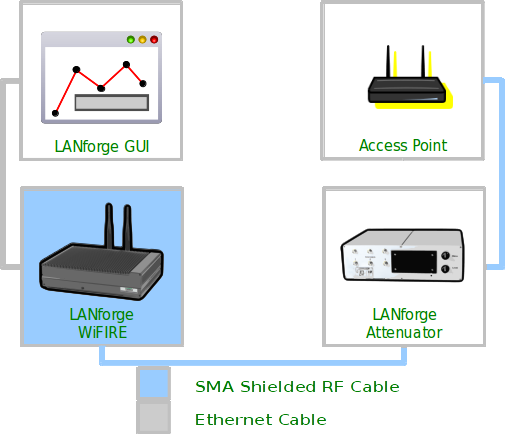 This demo consists of one WiFi access point and one CT523 LANforge WiFIRE machine connected to the LANforge Attenuator with coax SMA cables. (This is not over the air testing). 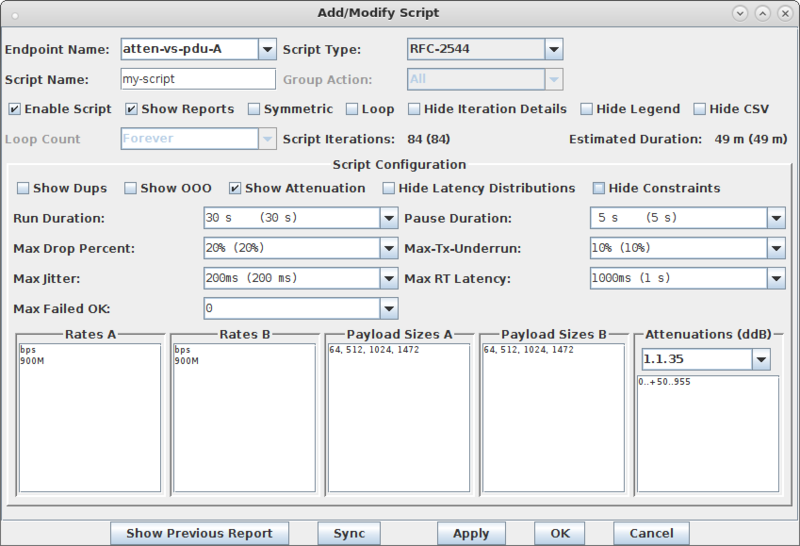 NOTE: These rate and PDU size settings will be manipulated by the script we setup later. Verify that the connection is operational before adding a script. Select Show Attenuation. This displays attenuation levels in the report. Run Duration: 30 sec. This is how long each iteration will run. Pause Duration: 5 sec. We give it some time to transition. Setup Pass/Fail Criteria and Iteration Steps for the script. For each Attenuation Level, the script will step through each PDU size at the desired rate. If there were multiple rates then for each Attenuation Level, the script would step through each PDU size for each rate. Rates A: 900Mbps. This sets the client download target rate. Attenuator Resource: 1.1.35. You can find your attenuator resources in the Attenuator tab. Attenuation: 0..+50..955. This is shorthand for: Begin at zero dB attenuation, increase in 5.0dB steps, until 955 dB of attenuation. Individual dB steps could also be specified. Save Data to be able to view past results. On the Layer-3 tab, click Start, and the Script Report window will appear. 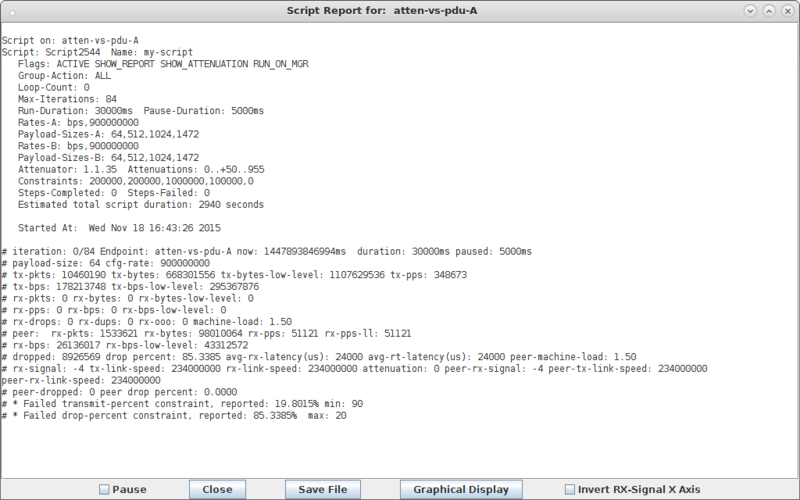 While the script is running, you can view the real-time results of the running script. Setup the Dynamic Report to view the data you are interested in. 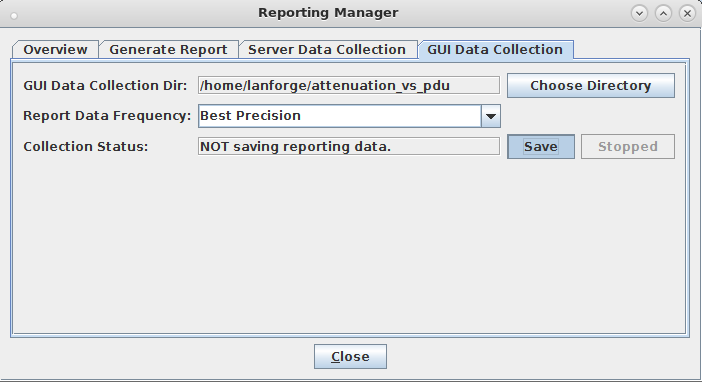 Set the Reporting Manager, Generate Report to the directory containing saved data. 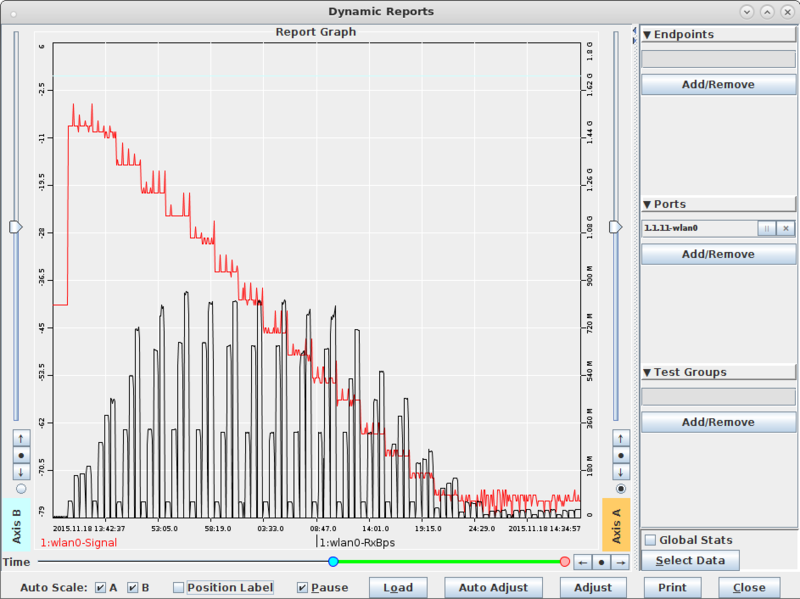 Adjust the time scale and Load the data in the Dynamic Report window. 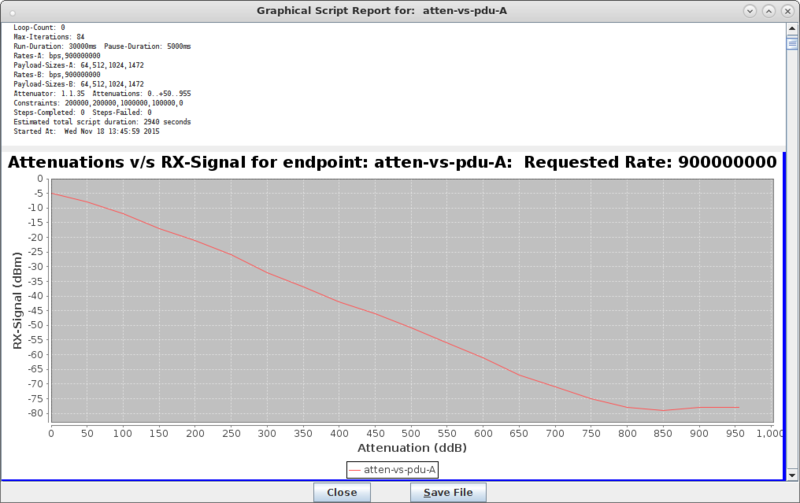 View the graphical results of the script when it completes. Scroll to the top of the window to view the graphs. Examples are shown below. Click on Save File and your browser will appear the the HTML copy of the report.